I am in Latvia this week for my team’s basketball tourney with the Central & Eastern European Schools Association (CEESA). There are 8 teams competition for title. This is my first time in Latvia, which also marks visiting all three of the Baltic countries, Lithuania , Estonia, and now Latvia. Latvia is 56 degrees north of the equator. Like many of the small countries in Europe, Latvia was not independent for most of its history. The Germans, Swedes, Lithuanian/Poles, and Russians, all at some time had control of Latvia. For most of my life, Latvia was a dotted line, pink state of USSR, and called LatviaS.S. They finally gained their independence for good in 1990. I was reading about this time in their history, and it was amazing to read that everyone from Latvia, Estonia, and Lithuania, joined hands and formed a line going through all of the capitals of the Baltics. There still are Russians here and I see many Russian signs. We are staying in Jurmala, which is a resort town, that many for Communist bosses from Moscow had summer houses on the southern Baltic shore. I asked two Lithuanians what is the relationship between the Latvia and Lithuania. The Lithuanians view Latvia as “the little brother” because their languages are very similar. It is probably the same relationship as Argentina has to Uruguay. They also said that the Latvians are more German than the Lithuanians, and Protestants instead of Catholics (Polish influence). The Latvians seem to be very quiet and tall. They are light-skinned with a variety of hair colors. 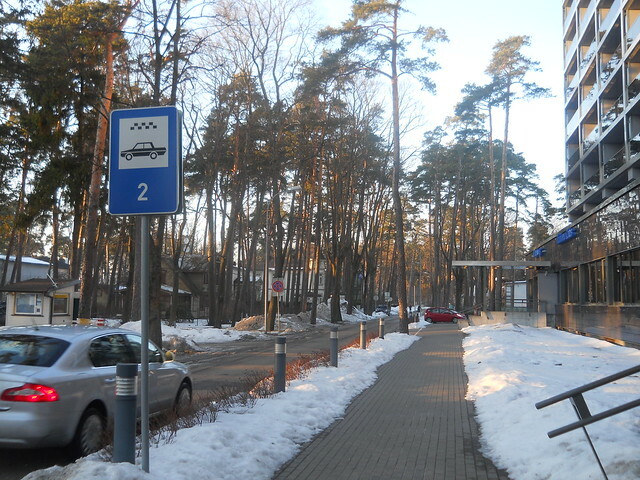 The town of Jurmala looks like a northern Michigan town, with its tall pine trees and big snow banks. I walked out to the beach. It must be nice in the summer. 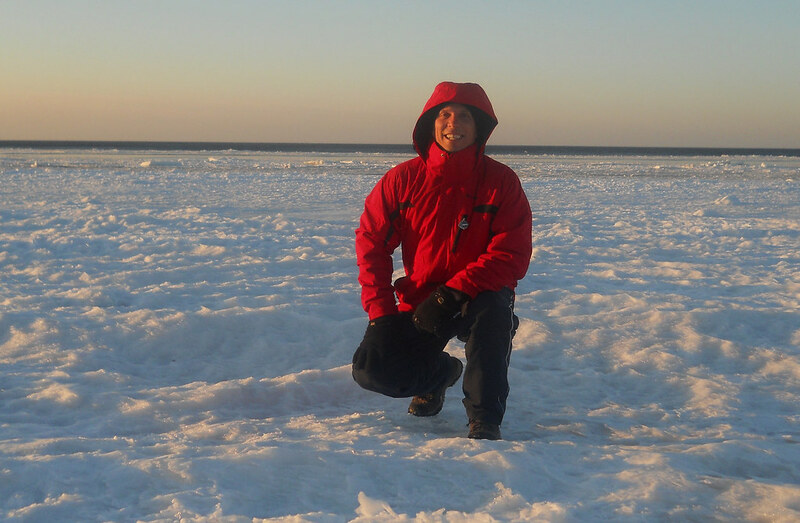 It is under ice right now, out to about 100 meters from shore. Hockey is big here and the Riga professional team is in the playoffs right now in the Russian League. The gymnasium we played is beautiful. It is mostly made of wood, and with the snow and pine outside the window, it really felt like a ski resort. Another aspect of the Baltic countries that I find fascinating is paganism. The Latvians were one of the last European people to convert to Christianity. Today, there are many folk traditions and actual worship in the manner of the pagans. Many Latvians believe in spirits of nature, etc. If I lived here, I would definitely want to learn more. After two days here I am getting to get a better feel for this part of the world. The topography and forests of Finland, Estonia, and Latvia all are similar to northern Michigan. The architecture is really interesting with a combination of modern and old wooden homes. I could easily live in any of these countries. The only point I don’t like is the Latvians and neighbors are very quiet people that it takes a while for them to open up. I have two more days here and I plan to go do some sightseeing after the finals.